Barcelona won LaLiga by 14 points last season, but that bald statistic does not tell even half the story as Atletico Madrid pushed the Catalan giants incredibly hard. The title hinged on Atletico's trip to Camp Nou in early March, when a typically brilliant Lionel Messi free-kick earned Barcelona a 1-0 victory that put them in pole position for the league. Diego Simeone thereafter switched his focus to the Europa League and Antoine Griezmann scored twice in a 3-0 defeat of Marseille in the final to justify that decision in some style. 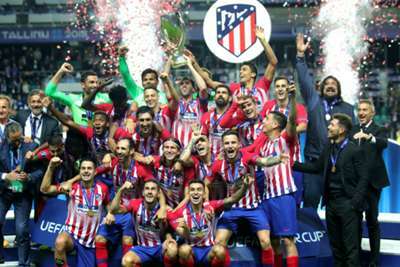 Atletico - who downed Real Madrid 4-2 in the UEFA Super Cup - look poised to offer Barca their strongest competition again this term, with their city rivals adapting to a new era without Cristiano Ronaldo and Zinedine Zidane. But do they have what it takes to give Simeone his second LaLiga title? Omnisport assesses the key factors in a possible Atletico challenge. World Cup winner Griezmann is a serious contender for this year's Ballon d'Or and the fact he will be lining up for Atletico again this season is massive for Simeone. Griezmann has been targeted by Barca two years in a row and both times Atleti have been able to repel their rivals, even if this time the France forward went to the trouble of making a television documentary where he mulled over his decision in excruciating detail. Getting Griezmann to sign another new contract quietens the speculation - at least for now - and his partnership with Diego Costa should develop further over the season. Costa's 27 goals fired Atletico to LaLiga glory before he joined Chelsea and, now the Brazil-born Spain striker is back, there is every chance he could do it again, with a brace in the Super Cup showing his sharpness. Griezmann was not the only Atleti player linked with a move either, as defensive lynchpin Diego Godin was reportedly a target for both Juventus and Manchester United. But the Uruguay international is staying put and both men are captains for Atleti in 2018-19. Not only have Atletico retained top talent, they have invested heavily in adding quality and depth to a squad that has leaned on Griezmann too much in recent years. Thomas Lemar did not show the best of his ability in 2017-18 but he played a key role as Monaco won the Ligue 1 title in the previous campaign. He adds a further France flavour to a squad that will see Lucas Hernandez increasingly influential at the back this term. Gelson Martins has arrived from Portuguese giants Sporting CP and he offers searing pace and a further goal threat, the 23-year-old having scored eight league goals in 30 games last term. A front four of Griezmann, Costa, Lemar and Martins can compete with anyone in world football. Although club icons Gabi and Fernando Torres have both departed, incoming players appear upgrades on the veteran duo. Rodrigo returns after developing into a Spain international at Villarreal, while Nikola Kalinic will hope to put a poor spell at AC Milan behind him. Former PSV defender Santiago Arias may also be an improvement at right-back on Kalinic's fellow Croatia international, right-back Sime Vrsaljko, who was sold to Inter. Atletico have bought very well during the close-season and in the event of Griezmann having an off-day, or suffering injury, it need not be devastating for their title chances. Rodrigo has claimed Atleti now have the strongest squad in LaLiga and he may well be right. Atleti finished three points above their city rivals last term and there is every chance they do it again in 2018-19, with Julen Lopetegui having a tough task to succeed Zidane at the Santiago Bernabeu. Lopetegui's club record is nothing special, although he was unbeaten during his time in charge of Spain, and adapting to the politics in play at Madrid will be a serious challenge for the coach, who became Los Blancos' first boss to lose his first competitive game since Bernd Schuster in 2007. Madrid are also yet to sign a replacement for Ronaldo and, while Gareth Bale can step up and Marco Asensio is poised to ascend to greatness, the absence of the Portugal captain cannot be understated. Barca are also heading into a new era, with Andres Iniesta having departed for Japanese club Vissel Kobe. Iniesta started 25 LaLiga games last season and he leaves a chasm at Camp Nou. Arthur has been signed as a potential successor but it will take time for the uncapped Brazilian to get anywhere near Iniesta's level. There are even question marks over Lionel Messi, who suffered such disappointment at the World Cup with Argentina and will no longer be pushed on to new heights by Ronaldo's similarly starry presence at Madrid. Only a fool would gamble against Messi inspiring Barca to yet more titles, but the timing looks perfect for Super Cup winners Atletico and Simeone to make their move.